North American sales of the now iconic Porsche Cayenne began in 2003. 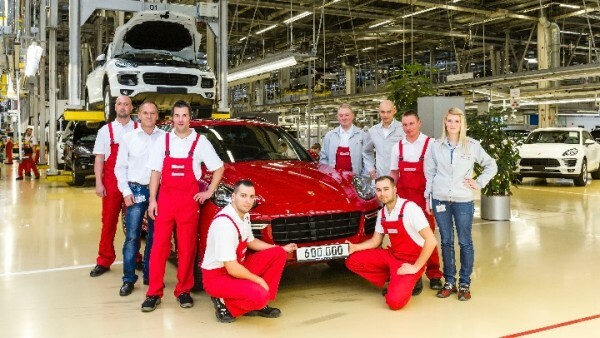 Since then, the Cayenne has hit production milestone after production mileston. Now, models from the Cayenne line-up make up more than one-third of Porsche's entire vehicle delivery count through the first 9 months of 2014. Late last week, Porsche announced yet another milestone in Cayenne history; the 600,000 unit just rolled off the assembly line. The newest model of the Cayenne is the GTS version, which celebrated its world premiere last month at the Los Angeles Auto Show. It's only fitting that this same model was the exact car to roll off the assembly line as the 600,000th Cayenne to be produced. "The Cayenne has grown to be the worldwide bestseller of Porsche over the last twelve years", says Siegfried Bülow, Chairman of the Executive Board of Porsche Leipzig GmbH. "As a team, we can be very proud of this. After all, it makes the Porsche quality seal renowned in more than 120 countries." During my factory tour earlier in the year the guide giving us the tour referred to the Cayenne as Porsche’s “Baby”, saying it with a big grin and twinkle in her eye!